“This is my body, which is given for you. Do this in remembrance of me.” In the same way, he took the cup of wine after supper, saying, “This cup is the new covenant between God and you, sealed by the shedding of my blood. Do this in remembrance of me as often as you drink it.” For every time you eat this bread and drink this cup, you are announcing the Lord’s death until he comes again. First, we should look back. We are to participate in Communion in remembrance of Christ (see verse 24). Though we must be reverent and must be appreciative of what Communion symbolizes, Communion also speaks of intimacy and fellowship. And so we look back. We look back to the cross. We remember what Christ accomplished for us. And we are reminded of His love for us. Second, we are to look ahead. The Scriptures say to do this “until he comes again” (1 Corinthians 11:26). The first time Jesus came to this earth, He came as the Suffering Servant. The next time, He will come as the Conquering King. Communion is an observance to remind us that Jesus will come again. Third, Communion is a time to look within. We are to look within and ask the Holy Spirit to show us any areas of our lives that may not be pleasing to God (see verse 28). Once we acknowledge these areas, we are to repent of these sins. To fail to do so and then to take part in Communion is to eat and drink damnation to yourself, as the King James Version renders it. Or, it is to eat and drink, “not honoring the body of Christ” (verse 29). If there is something that isn’t right, this is the time to deal with it. Communion is an ideal time to make a commitment or recommitment to Jesus Christ. Copyright © 2008 by Harvest Ministries. All rights reserved. 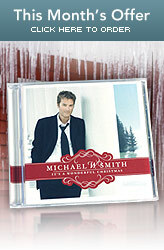 Michael W. Smith has put together a new Christmas album that you will want to be a part of your Christmas listening for years to come, called It’s a Wonderful Christmas. This album is filled with songs that honor and glorify God, and will lift your spirits and help you remember what this season is really all about. You can have your own copy of It's a Wonderful Christmas in appreciation for your gift sent to Harvest Ministries this month.